Size: 4.4 to 5.9 mm for males, 5 to 7.7 mm for females. Biotope: Woodland edges, clearings, sparse woodlands, on low growing vegetation. Web: No web. 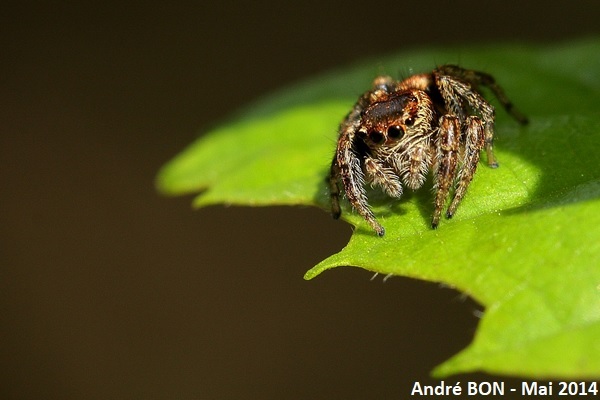 Spiders of the Salticidae family chase by looking at preys with their big size eyes. They move by jumping. Observation period: You can observe adults from May to August. Spiders of the Evarcha genus show a large cephalothorax and strong fore legs. Evarcha falcata shows an important sexual dimorphism. Males bears a cephalothorax with a pale yellow stripe above the eyes. It is followed by a pale brown area extending just a little beyond the posterior lateral eyes. The back of the cephalothorax is black. There are two white lateral bands curving and getting closer to the other at the back. 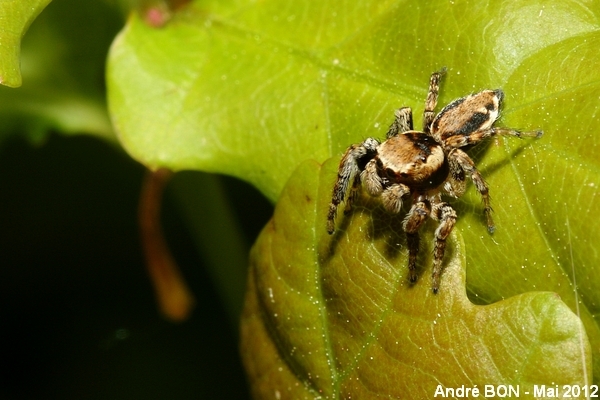 Evarcha falcata has shorter white hairs on the face than Evarcha arcuata. The abdomen is circled with white and shows a pale brown central area bordered with black. 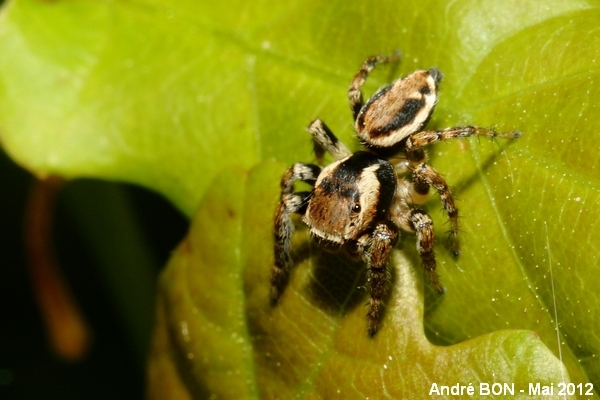 Females are very similar to those of the Evarcha arcuata species with a black median line on the front part of the abdomen and black lateral spots at the back (not always present). I have observed this Evarcha falcata on young oak shoots in a clearing. I had just enough time to shoot three pictures before it disappears under the dense low growing vegetation. 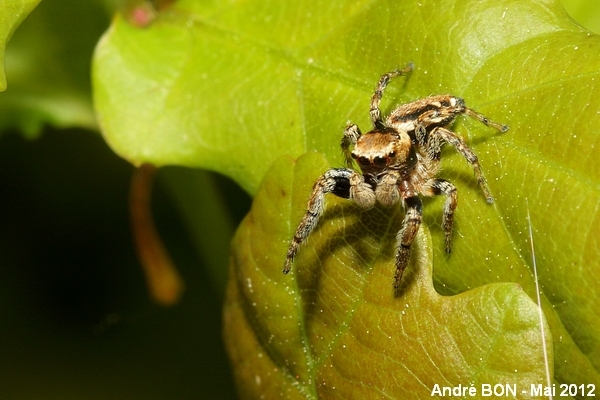 Here you can clearly see the pedipalps indicating one male and the pale yellow stripe above the eyes. There is no possible confusion after seeing the colours of the abdomen and cephalothorax. This is not easy to shoot a front picture of Evarcha falcata, right in front of the median eyes. I will content to get one of the posterior lateral eyes. I have listed this specimen as Evarcha sp. but I think there is a high probability that it is one female Evarcha falcata. This is based on the woodland habitat where this observation was done. I observe there male of this species from time to time. Evarcha arcuata with which there is a possible confusion is mainly found in much more open grasslands. The weekly marked white lines below the eyes are also an indicator for Evarcha falcata.